This ragout is super simple and so flavorful. I love that this recipe called to make the sauce separate since it makes a large amount. I have a couple of recipes planned that utlitze this ragout. I always thought that ragout was just a mixture of vegetables, but really it’s a well-seasoned meat or fish stew usually with vegetables. In a large saucepan, heat the olive oil over medium heat. Add the onions, pepper and garlic and cook, stirring until softened, about 5 minutes. 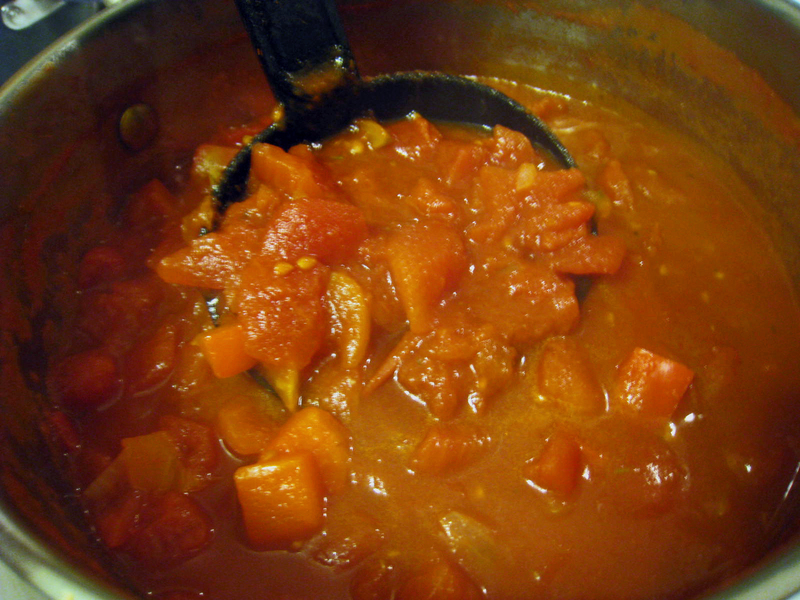 Stir in the diced tomatoes, tomato paste, vinegar and oregano. Bring to a simmer. reduce the heat to low and partially cover the plan. Simmer for at least 10 minutes and up to 1 hour. Serve over chicken or white fish such as flouder, halibut or tilapia. Store the leftover sauce in portions that make sense to you. This recipe makes a lot, so be prepared to have 3 to 4 more uses out of the this. The ragout can be refrigerated up to 4 days or store in the freezer for up to 3 months.